Use our pepperoni pizza recipe and you'll be biting into cheesy goodness in mere minutes. Our Cheesy Pepperoni Pizza recipe is great for anyone in a hurry. Place pizza crust on baking sheet; spread with CHEEZ WHIZ. Bake 8 to 10 min. or until mozzarella is melted. Serve with a mixed green salad and a piece of your favorite fresh fruit. Substitute 2 Tbsp. each chopped OSCAR MAYER Ham and drained canned pineapple chunks for the pepperoni and green peppers. 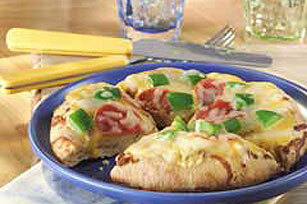 Substitute 2 English muffin halves, 2 pita bread rounds or 2 bagel halves for the pizza crust.